When you decide to care for your aging parents, it becomes very important to get the right home care equipment and furniture. Without these, you risk adding increased danger of injury and discomfort to your parent’s lives, and also end up putting in more effort and time because your task gets harder. Look for durable furniture that has been designed to suit the needs of your aging parents. This will include sturdy beds, wardrobes and seating arrangements in your parent’s room. The bed as well as sofas or chairs should be higher because low height beds pose additional stress on knee joints as one needs to bend a lot more to get in and out of the bed. 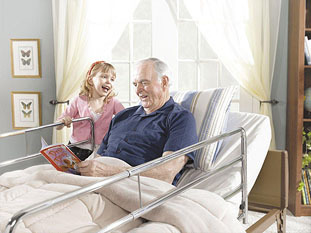 In fact, if your parents have been unwell, a hospital bed might be the ideal choice, as it will allow you to put the bed in an upright position during cleaning and feeding. When it comes to other furniture pieces like wardrobes and chests, the best home care equipment for aging parents is the one that is sturdy, stable and also easy to access. Choose high quality wood wardrobes that are anchored to the wall, rather than flimsy plywood wardrobes that could topple over. Seating arrangements should be well padded, with adequate back support. Also, ensure that you do not clutter the room with small pieces of furniture that make it hard for your elderly parents to navigate through without bumping into stools and chests with sharp corners that may result in an injury. To care for your aging parents, you will need the necessary equipment to make their life more comfortable. Equipment like a walker or cane, a bathtub seat, wheelchair (if needed) and a raised toilet seat will not only assist your parents to be more independent, but also ensure their safety. Make sure you choose durable equipment that ensures safe assistance, so as to simplify life not only for your parents but for you as well. Walkers and canes will make your parent feel more independent, as they will be able to move around the house without any assistance, in a safe way. Some walkers can be fitted with baskets, trays and bags to help your parents carry their belongings from the bedroom to the living room with ease. With canes, you have the option to choose from single-point, quad and tripod canes and most come with adjustable height to offer more flexibility and stability. Bath seats and toilet seats come in varying heights and will make it a lot easier for your parents to use the bathroom. You could choose a clip on toilet seat that is upright, or can even pick a bedside commode if your parent is too sick to make a trip to the bathroom. Bath seats fit easily inside bathtubs and shower cubicles, and make bathing more comfortable for the elderly as they can remain seated. Also, if your parents have mobility issues, a wheelchair is a great option to give them more independence. You can choose from an electrically operated, standard and manual push wheelchair variety, based on the needs of your parents. Other simple equipment you will need includes – grab bars for the bathroom to offer stability and safety, non-skid pads in the bathtub to avoid nasty slips and falls, a call monitor next to the bed for ease of communication, and proper night lighting to avoid accidents and falls. Ana Grgic is a blogger who likes to write articles on all things related to travel and lifestyle and health and fitness. She loves to travel and learn about different cultures and traditions. She likes to share her thoughts on anything and everything with anyone that will listen.